CLIENT: PN Hoffman and Madison Marquette. SCOPE OF WORK: Architecture, Interior Design. SIZE: 22000 SF. LOCATION: Washington DC. STATUS: UNDER CONSTRUCTION. PROGRAM: Maritime services, Retail, Restaurant. Water Building II at The Wharf in Washington, DC., developed as part of Phase 2 of The Wharf, a $2.5 billion, 3.2-million-square-foot waterfront neighborhood along the Washington Channel, houses 22,000 square feet of space, including maritime services and retail on the ground floor and restaurant/bar on the second level. It is located on the axis created by two new important public spaces in the southwest waterfront: The Grove and M Street Landing. 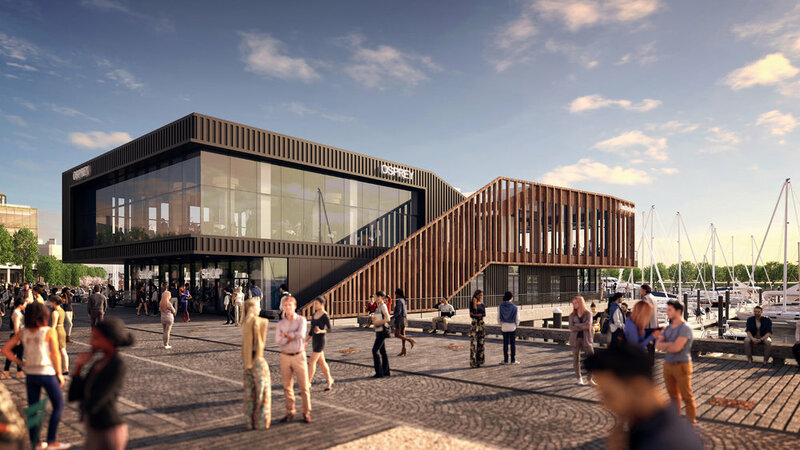 The design reflects a modern interpretation of a utilitarian pier building while utilizing materials that are traditional to such structures. The forms reflect the different programmatic uses contained within and are oriented to capture the most prominent channel views. 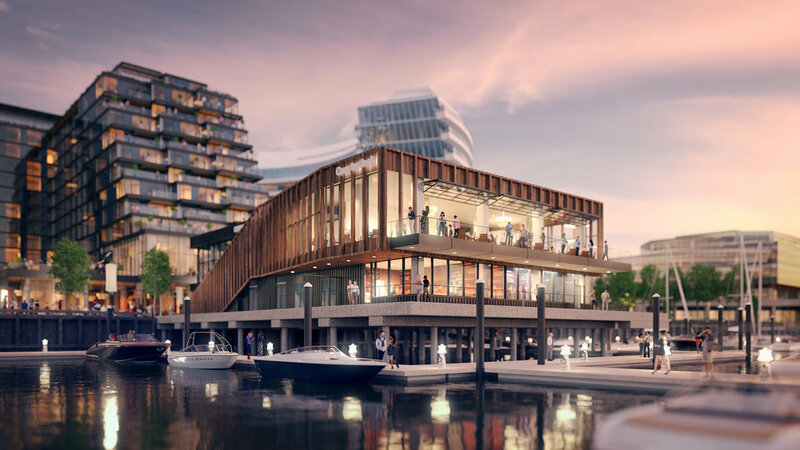 With a façade composed of wood fins and zinc-coated steel panels, the articulation is intended to create a refined appearance on the wharf side and a more casual appearance on the water side. The green roof represents an elevated extension of M Street Landing and serves as an elegant roof-scape for occupants of adjacent high-rises to gaze upon.